Werewolves Within brings the fun of game night with friends to Virtual Reality. After several attacks on townsfolk, the medieval village of Gallowston has had enough! 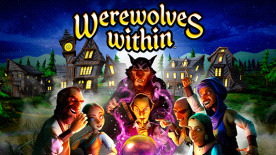 Werewolves Within will transport you to the medieval village of Gallowston, where you must uncover the werewolves that have been terrorizing the townsfolk. Werewolves Within is a fast-paced game of hidden roles and social deduction for 5-8 players. In one game, You might be a villager trying their hardest to cleanse the town of werewolves, while minutes later you could be the werewolf lying and betraying friends in order to survive the vote. Utilize specific roles and abilities, and the power of persuasion to assess, deduce and win the round. Whether playing a vigilant villager or a devious werewolf, no two games are ever the same.